Advertising is everywhere, especially on the Web. Most websites I visit have some sort of web banner advertisements on them. 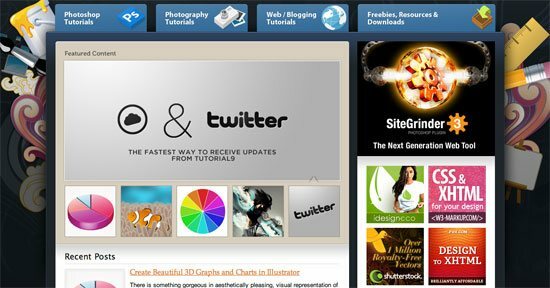 For some websites, such as big design blogs, advertising is the main source of income. With that in mind, it’s clear that website owners need to think very carefully about how their ads are displayed and where they are placed in relation to other elements on their site. I have put together a showcase of different ways that a few websites show their ads, which might be helpful when it’s time to place banner ads on your site. Some are bang in your face while others are more subtle, blending in with the web design. The ads on CSS Remix are displayed along the top of the site and blend in well with the site listings. Design Bombs displays their 125px ads on the left-hand sidebar. The ads fit in with the other gallery listings on the site. Noupe displays their ads next to their site content and at the very top of their site. They also have a small line of text below each image ad. This structure is the same as Smashing Magazine, who aquired the site recently. The FWA web gallery displays a huge variety of ads on their site’s top right-hand corner consisting of three web banners at a time. 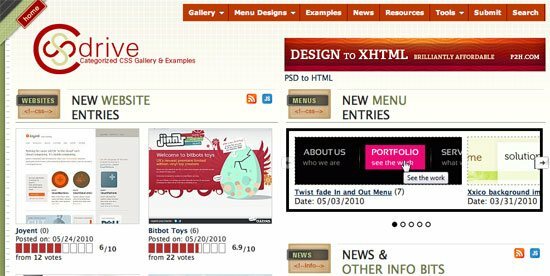 A beautiful site should have beautiful ads, and that’s what Webdesigner Depot has. They display their ads in a clean and simple format on their right-hand sidebar. This clean website design has a bunch of excellent banner ads that run seamlessly down the right-hand column. It looks great! The new beta Behance Network website design has small sponsor boxes down the right-hand column that display ads next to their content. It works very well with the new site design. PSD Graphics has a huge banner ad in between their layout’s header and sub-menu. It works well with the site design because it’s the right size, and I also think it grabs people’s attention. Nick La has used his dark website design to an advantage because all of the ads on the this CSS gallery are very bright and colourful, making them truly stand out. BrushKing has a nice, rich, brown and red colour scheme. The web banner in their header works so well because it fits with their site design. Web Designer Wall has an in-content ad at the top of all their articles. 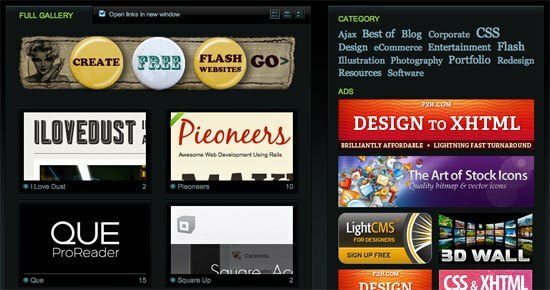 Seven 125px banner ads are displayed in between Creattica’s design inspiration listings. Tutorial9’s colourful ad banners fit perfectly into the right-hand sidebar, and the ilustrative header helps the ads stand out. The colourful ads fit right in on the right-hand side of this design blog. PSDFan has a large web banner that sits right above their blog posts, under the navigation. WpRecipes.com has a nice subtle sidebar in which they display 125px web banners. The background that curves around the site makes everything look more colourful. 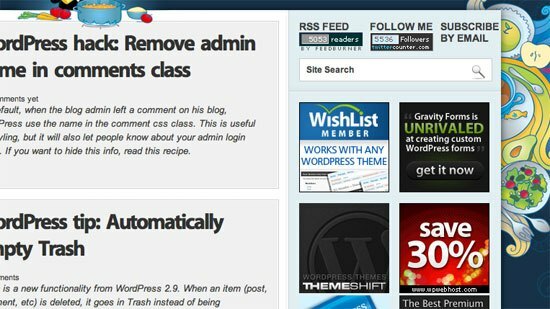 CSS Drive has many elements packed into their site. They even have enough room to include ads that blend into the site design very well. Veerle’s design blog displays ads via The Deck advertising network on her left-hand sidebar. Everything on the site has a lot of padding and space, which makes the viewer not miss the ad when scrolling. The huge Flash community, kirupa.com, displays small little adverts on the right-hand side of their site. 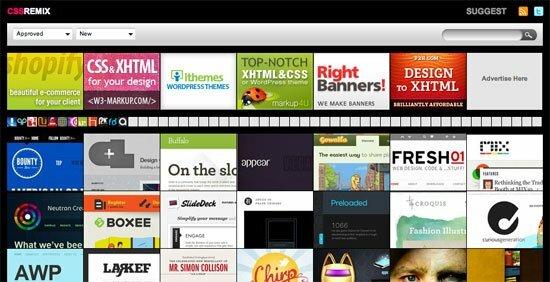 The popular site tuts+ network by Envato displays a large banner ad on the top of the site’s content, and also has ten smaller web banners on the right-hand sidebar. The banner has a nice rotated “advertise here” button next to it, which I like. Function displays their ad banners in a narrow but tall column in the center of their page. Brusheezy has a really clean web design, featuring their web banners on the sidebar. Mobile Web Design: Is it Worth It?